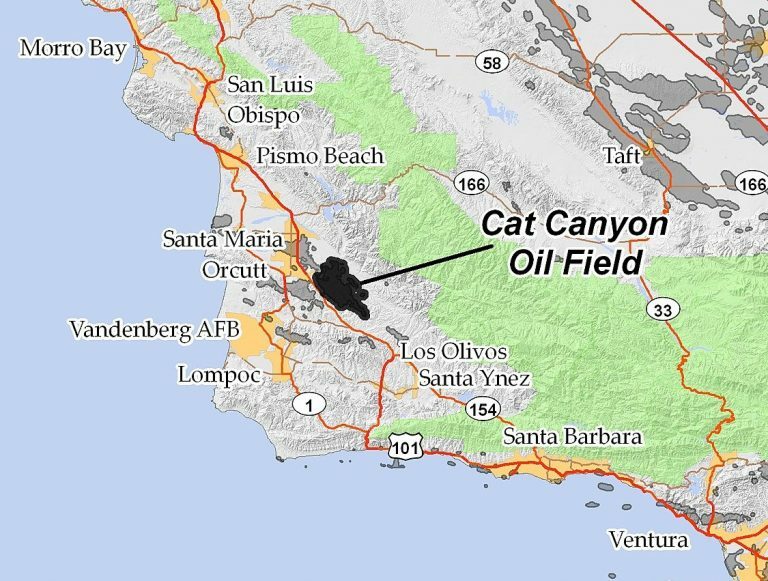 The Cat Canyon Oil Field, located about 10 miles southeast of Santa Maria, has been operational for about 100 hundred years. Production at Cat Canyon has declined in recent years, but a few operators of the field plan on using new extraction technology to ramp up drilling. One project that would add approximately 200 wells to the oil field is currently being debated at Santa Barbara County Planning Commission meetings. A March 13 hearing on the matter prompted demonstrations by environmental activists and fierce debate during public comment. Project applicant ERG Operating Company, a subsidiary of Houston-based energy firm ERG Resources, initially proposed developing and operating 233 new thermally enhanced wells that use steam injection to extract oil. Initial plans called for the development of 10 new wells pads and one new steam generator pad, as well as the use of 91 existing pads. Santa Barbara County planning staff responded by proposing a scaled-down version of the project that would consist of 87 new thermally enhanced oil wells on 91 existing well and equipment pads. The revised version of the project eliminates new well pads and reduces total well development by 20 percent. Under the revised plan, the project would generate 8,000 barrels of blended crude oil daily, as opposed to 10,000 barrels, as initially envisioned by ERG Operating Company. No fracking is involved in the project. Revised project plans still include the development of one new generator pad, as well as the replacement of an existing four-inch diameter fuel gas pipeline with an eight-inch diameter pipeline that stretches 3.5 miles. The project site is an approximately 75-acre area within an 8,054-acre property at West Cat Canyon that is owned by ERG. Existing ERG operations at the site include 185 active or idle non-thermal wells and 314 active or idle thermal wells. If the project is approved, oil tankers would initially transport crude produced at ERG’s West Cat Canyon site to the Phillips 66 pump station in Santa Maria. From there, the oil would be sent by pipeline to Phillips 66’s Nipomo Mesa refinery. ERG plans to cease truck transport of the oil once its 2.9-mile Foxen Petroleum Pipeline becomes operational. A Santa Barbara County staff report lists numerous environmental concerns about the project, including the potential of an oil spill and the possible contamination of the Santa Maria groundwater aquifer from a spill or from routine well drilling, cyclic steaming or oil production. Concerns are also raised about tanker trucks transporting oil and the project’s greenhouse gas emissions, which are expected to exceed a county threshold. Environmentalists question the safety of the project and argue against new oil production in Santa Barbara County. Supporters of ERG’s plans have touted the project as a way to decrease California’s dependence on foreign oil and replace imports with local production, which must adhere to higher environmental standards. The planning commission will resume its hearing on the ERG project at its March 27 meeting. Meanwhile, other Cat Canyon projects are not as advanced but could reactivate production in other sections of the oil field and add hundreds more thermally enhanced wells. The Aera East Cat Canyon redevelopment project calls for the construction and restoration of about 72 well pads and the drilling of up to 296 wells. The PetroRock UCCB project consists of plans for 231 new wells on 29 pads. You’d think with all the “woke” progressives running California without opposition from the repub’s there’d be no oil production at all in CA. Wouldn’t it be a hoot if woke-liberals were persuadable with oil money? Not a “progressive” issue, more of a resource preservation issue. Local ranchers, farmers, fishermen, and town folk want to protect their way of life and have every right to. We are just fine without the oil production. They have possibly come to the realization that when the oil spigot is turned off, so is their money flow for schools and other things that they approve of. Talking ill against one’s own mother? For shame, for shame Nazbol. Funny how anti immigrant, anti environment, and misogyny all seem to run with each other.